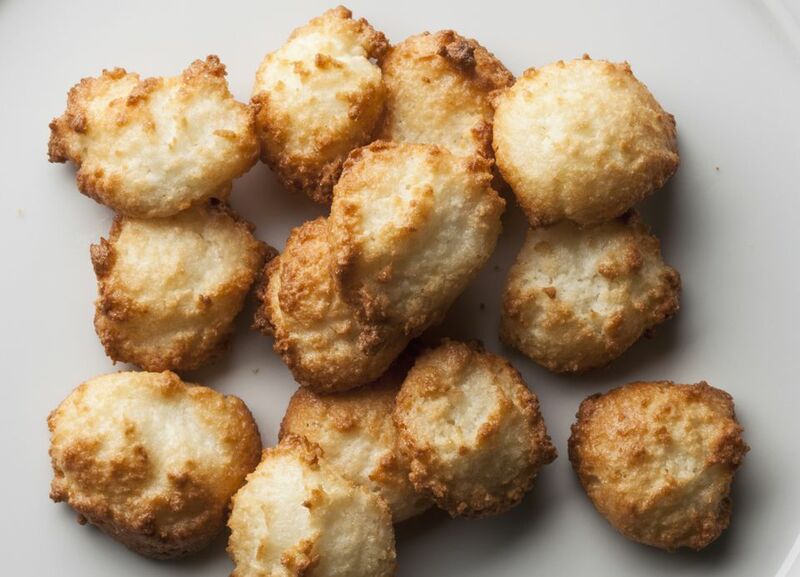 These coconut macaroons are a tasty combination of egg whites, coconut, and vanilla. The cookies are easy to prepare and bake. Grease and flour baking sheets and preheat oven to 300 F (150 C/Gas 2) . In a small bowl with a hand-held mixer, beat egg whites and salt at high speed until soft peaks form. Sprinkle sugar in, 2 tablespoons at a time, beating well after each addition until sugar is completely dissolved. This will take a few minutes after each addition of sugar. (Whites should be in stiff glossy peaks by the time you're done.) Beat in vanilla. With a rubber spatula, fold in coconut and flour. Drop coconut by teaspoonfuls about an inch apart onto the prepared baking sheets. Bake at 300° for 20 minutes, or until lightly browned. With spatula, carefully remove cookies to rack to cool. Store in tightly covered container for up to 3 days.